This book is the sequel to Crank by Ellen Hopkins. If you have not read it, some details in the review below may be spoilers. Kristina managed to pull herself out of the horrible downward spiral of drugs and addiction when she found out she was pregnant. Now that she's had Hunter though, she chafes at the restrictions her family still imposes on her, and longs for a place of her own, a guy to love her...and the monster. She finds herself moving to glass, involved with some dangerous people, and falling in love all over again...but not without some serious consequences. Will she get in over her head? Hopkins' second novel in verse about the troubled Kristina is compelling and heartbreaking at the same time. Kristina wants what most eighteen-year-olds do: independence, income of her own, a place of her own, and love. But how she goes about trying to achieve it is not the path many would take, and as she takes that first step towards the monster, readers can't help but hope for the best and be frustrated at her stupidity and thoughtlessness. 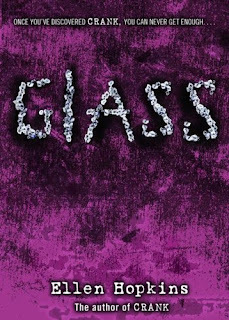 The scariest aspect of Glass is how, as the story goes on and Kristina becomes even more hooked, it becomes increasingly apparent that there can be no happy, clean ending, and the struggles and dependence on drugs will always be a part of Kristina’s life. This is a gut-wrenching, dark read that reveals the power of true addiction and the pain and havoc it can wreak. Cover Comments: I do like the grittiness of the cover, and how the title looks like it has been formed out of bits of glass. It's very appropriate to the story, eye-catching, and it goes along with the style of the prequel. Very nice. Click here to read about when I met Ellen Hopkins! I think Ellen Hopkins is just a phenomenal author! Glass is just great. You definitely need to read more of her books! I just finished reading Crank and I thought it was amazing. Ellen Hopkins is one of my FAVORITE authors.